Learn more information about bowling lane specifications is a good way understand the bowling alignment process and to sharpen your adjustment skills. Let's begin by examining useful bits of information about United States Bowling Congress (USBC) bowling lane specifications. A regulation bowling lane, including flat gutters, kickbacks, and the approach, must be constructed of wood and/or other synthetic materials which have been tested fully and approved for use by the United States Bowling Congress. The approach extends from and is exclusive of the foul line and shall be an unobstructed level approach not less than 15 feet in length, free from depressions 1/4" or more, and not less than less than the width of the lane. The foul line must not be less than 3/8" nor more than 1" in width, extend across the entire width of the lane at a minimum, and be distinctly marked or embedded between the lane and the approach. When a bowler stands the full distance back on the approach with the heels of the bowling shoes positioned at the far back edge of the approach, a distance of about 75 feet exists to the head pin. Many bowlers will take five steps from 15 feet away from the foul line and over-stride to reach the line to deliver the ball leading to poor balance and tempo. Because the approach extends 15 feet back from the foul line does not mean any given 5-step bowler must stand that distance from the foul line when assuming the stance position and getting ready to bowl. The set of guides located 12 feet back from the foul line are also useful to align yourself with but do not necessarily indicate that a bowler using either four or five steps stand 12 feet from the foul line. Many bowlers struggle reaching the foul line and therefore release the ball into the approach surface rather than beyond the foul line onto the lane surface where oil conditioner exists to help skid the ball properly down the lane. Why, because of standing too far from the foul line based on their natural stride length. Usually, these bowlers would be better served to move forward on the approach so good balance and tempo can be maintained while walking to the foul line. The opposite is true for bowlers who do need to stand further from the foul line and get the feet moving more quickly and stretch out steps to achieve improved balance, leverage, and ball speed than standing too closely to the foul line. These are good reasons to consult a certified coach if you are learning to bowl or is you are seeking to improve your game. Make sure your footwork matches best with your natural stride and pace of steps. 1. the kickback is 24" above the pin deck at the highest point and 17" above the deck at a lower point. 2. the tailplank is 2" maximum thickness and the pit cushion is 9 7/8" thick. 3. the pin spots are fiber spots 2 1/4" in diameter. 4. the center of the 7 & 10 pin spots are between 2 1/2" and 3" from the edge of the pin deck and the centers of the pin spots are 12" apart set in a equilateral triangle formation. 5. the gutter (channel) width is 9 1/4" in width. 6. the gutter is 1 7/8" beneath the lane surface. 7. the lane is made of tongue and grooved bed stock. typically laid on edge or of a synthetic material giving the appearance of boards sitting on their edges. 8. the center of the head pin spot is 60 feet plus or minus 1/2" to the foul line. 9. the overall length of the lane to the pin deck is 62 feet 10 3/16". 10. the lane is 41 1/2" in width. If the lane is 60 feet long from foul line to the head pin where the pocket is located, then it is important to learn that the lane oiling machines typically applies oil to the lane surface with the heaviest concentration of oil from the foul line to about 20 feet distance past the line and from approximately from about the 10th board from both edges of the lane toward the center of the lane (in most house conditions), commonly referred to as the "front-end" of the lane. The second twenty feet of the lane, commonly referred to as the "mid-lane", has a less concentration of applied oil to the lane surface, and the "back-end" of the lane, the final 20 feet of distance to the head pin is clean and dry with no oil applied as to allow the bowling balls to grip the surface of the lane and if the traveling bowling ball axis is tilting, the ball can hook toward the head pin and the pocket. With this knowledge of the oil distance application by the lane oiling machines, it is easy to visualize why a ball will slide while rolling on the front end of the lane, read the mid-lane, and begin to change direction, or hook toward the pocket, if the bowler applies a release technique encouraging a hook result when delivering the ball as it arrives at the "Break Point" predictably and on the dry portion of the the back end of the lane. The Break Point usually is located about 6 feet distance past the point where the lane machine cuts off oil application across the lane surface, depending on the distance of the oil pattern applied to the lane surface. If a bowler thinks of the lane in three sections down the lane and realizes that there is a graduated friction factor from the front end to the back end of the lane, it will help to visualize how to align initially and select an intermediate target for siting purposes which corresponds to the given oil pattern and to the Break Point down the lane. Naturally, the cross lane ratios of oil applications will determine now near the lane center or how near the edge of the lane a given bowler will select for initial alignment purposes. A good objective for any bowler is to try and match the Break Point of the bowling ball with the Break Point on the lane. The surface of the lane must be free of contiguous grooves or ridges, 40/1000" tolerance for crosswise tilt, crowns, and depressions. The lane surface must also have a lengthwise tilt tolerance of 40/1000". Older wooden surfaces, twenty or more years old, will likely encounter greater lane depressions or crowns compared to synthetic lane surfaces because of the where the sections of hard maple wood or softer pine wood splice at the end of the front portion of the lane and where the back end of the lane begins and because of the number of cuts to the wood the resurfacing crews have administered over the life of the lane beds. Also, sometimes in the cases with aging or synthetic pin decks which fall out of tilt tolerance, the bowling balls will actually go airborne and will cause increased deflection upon impact with the pins and thereby reduce the effectiveness of pin carry. It is important for the maintenance crew of any given center to maintain level lane surfaces and level pin decks so the ball will travel without leaving the lane surface and losing velocity. The lane and approach markings allow for a maximum of 7 guides embedded in or stamped on the approach at each of the following points: 2"-6", 3'-4', 6'-7', 9'-10', 11'-12', and 14'-15'. Seven targets (arrows) may be embedded into or stamped onto the lane 12'-16' distance past the foul line and must be uniform in length and in shape and must be at a maximum of 1 1/4" in width and 6" in length. At a distance 33'-44' beyond the foul line, there maybe 4 targets uniform in appearance no wider than a single board nor longer than 36". Each series of guides 6'-7' past the foul line must be parallel to the foul line and circular in shape with a maximum of 10 guides not to exceed 3/4" in diameter. The most recognizable and most widely used guides are the targeting arrows about 15 feet from the foul line which are used essentially for intermediate alignment purposes when targeting the pocket some 60 feet away from the bowling ball release point just beyond the foul line. It is obviously easier to select a target nearer you than at a greater distance when aligning initially before making a delivery. Some bowlers prefer using the round guide dots about 6 feet past the foul line rather than the arrows. Using the closer set of guides can be tricky because the guides do not align precisely with the pin formations on the pin deck whereas the arrows do align more closely to the pins set in formation. Consult a certified coach if you have any questions how to achieve a good initial alignment to the Break Point based upon your particular skill set. The foul light beam is no more than 1/4" beyond the approach, fully automatic, and must be visible between 10-15 seconds duration. No question too many bowlers who complete their footwork slide too far from the foul line out of fear to slide through the foul light beam. Most top professional and amateur bowlers today slide no more than four inches from the line and certainly release the bowling ball onto the lane surface where the greatest concentration of oil is located to help the ball slide effectively down the lane. Visualize the bowling ball entering the lane surface off of a bowlers hand and slightly beyond the foul line at an angle to the lane surface similar to an aircraft making a smooth landing onto a runway as to avoid bouncing the wheels of the aircraft. Releasing the bowling ball behind the foul line at too steep of an angle will produce bounce, inconsistent skid length, and influence the bowling ball to not react as intended. We hope this information about a regulation bowling lanes provides useful insight into achieving a good results on the lanes. While you are visiting our site today, please check out the vast menu of bowling consumer products we offer at great prices, with no shipping charges, with free insurance, and delivery right to your doorstep! bowlingball.com has become the No. 1 “e-tailer” of choice for bowling equipment by the consumers of America. Ordering is an easy process by following simple online instructions. 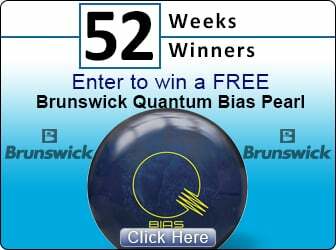 Thanks for visiting bowlingball.com! 2. How Do I Read The Bowling Lanes?